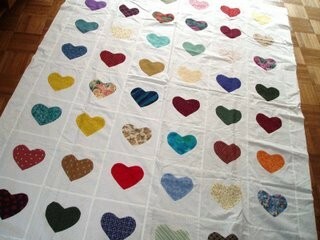 Next up on the quilting table here is Dee’s Hearts, a lap quilt for the Quilt Studio 40 quilts challenge. It was lovingly appliqued by Dee of Thea Quilts The colorful hearts are on a white on white background. 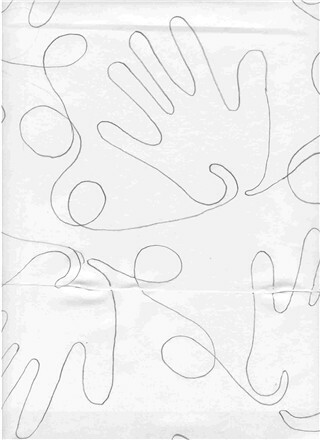 I’m thinking of using a panto that I drew up for another quilt that has hands all over it. Only I think that I will add a little heart to the palm of each hand too. That is the plan anyway. Though many times when I get a quilt on the table it lets me know that it wants something other than what I have in mind for it. So we shall see how this one goes. What a sweet quilt! I bet your panto will look very nice on this one. What a pretty quilt! Hands and hearts – sounds like a great combination. Oh Deb, this sounds wonderful. I just know whatever you do will be sweet. I hope it doesn’t cause you too much grief. Can’t wait to see what it looks like.